This whole notion proactive — and very fast– monitoring is a fascinating proposition more workloads flow to the cloud. And, it’s the reason we picked Stackdriver as one of our ten Launchpad Finalists, out of nearly 90 entries, for this year’s Structure:Europe September 18 and 19 in London. Unlike other SaaS monitoring services, Belcher said Stackdriver collects data from multiple layers — the cloud infrastructure, various on-premises systems, and the applications and then applies its own special analytics to identify patterns, anomalies and outliers that show trouble brewing. The company’s outlier detection, for example, can see that one node in a cluster is processing fewer images than its peers and based on that data, help the customer figure out whether that’s because of bad code, a misconfiguration of an AWS Elastic Load Balancer or an overloaded system. Legacy systems management offerings — from companies like CA(s ca), Nagios, Tivoli(s ibm), BMC — have been outmatched by the fast-changing dynamics of cloud computing. AWS Autoscaling, which adds and subtracts compute resources on the fly as workloads spike and ebb, just “blows them all out of the water,” Azeri said. That fast-changing infrastructure requires equally fast data collection and analytics which is what Stackdriver says it brings to the table. 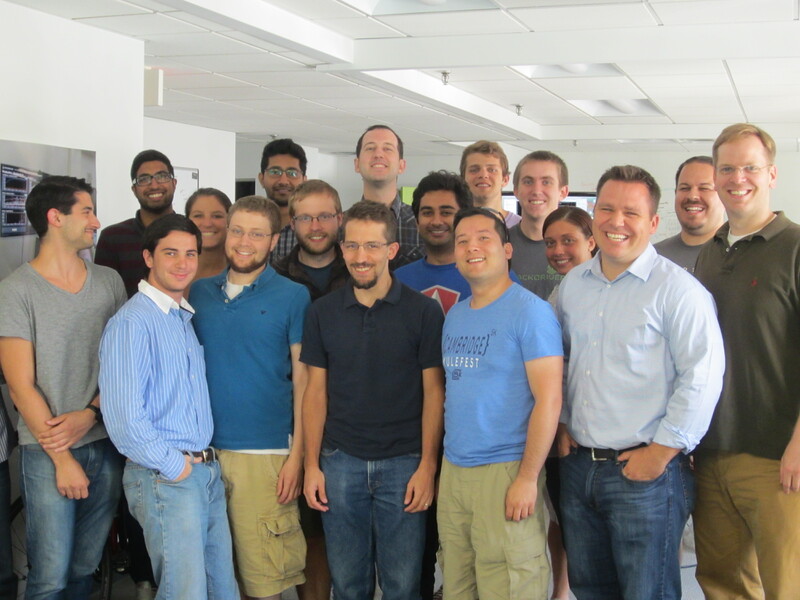 Born in a Northeastern University conference room in 2012, Stackdriver snagged $5 million in Series A venture funding a year ago from Bain Capital and others, and now with 17 employees (and 3 interns) operates out of a for-real office in Boston’s Downtown Crossing. With many employees recruited out of Northeastern, Boston College and Boston University, there’s a nice balance of youthful exuberance and industry savvy from veterans Belcher and Azeri as well as Architect Patrick Eaton, an alum of EMC(s emc) and Endeca/Oracle(s orcl). Teamwork is a huge focus as evidenced by how hard it was to get a photo of the founders, who insisted on a team picture (below.) I finally snapped Azeri (above right) but only because he got up to make a point. Make sure you come check out Stackdriver’s demo at Structure: Europe. I bet the enthusiasm will be catching. It seems to be a rather successful startup, but at the same time it reminds many other tools which are used to monitor apps and networks for example, the solution Anturis which is rather popular now. This is really exciting, loads of companies claim to have the tools to monitor everything. where this differentiates is the analytics and correlation between on premise and off premise equipment and can predict failures. The fact that a lot of large big names went off to form this suggests to me that this is the one to watch for the future. This space is so competitive and flooded I hope that this company become the incumbent!